It is generally accepted that rheumatic fever (RF) follows group-A beta-hemolytic streptococcal (GAS) infection. The GAS infection is followed by a latent period before the onset of RF. During the latent period, immunological perturbations occur to initiate RF [Figure 1]. Wannamaker wrote that "RF represents the chain that binds the heart to the throat. However, the chain of events biochemical and immunological, between streptococcal sore throat and the onset of RF is still unknown." The statement is true even today. Because of the decline in the prevalence of RF in developed countries, very limited research related to the pathogenesis is being carried out at present. Virulence of RF is related to its capacity to cause permanent cardiac damage. Resurgence of RF in the inter-mountain area of USA indicates that carditis, based on clinical features combined with echocardiogram findings, occurs in almost 90% of patients. Rheumatic carditis has been described as a pancarditis involving the pericardium, the myocardium, and the endocardium. Recent studies indicate that RF does not cause myocardial damage. Hence, it is unlikely that research directed toward myocarditis will help unravel the pathogenesis of RF. The purpose of this communication is (i) to summarize studies which indicate that RF does not cause myocarditis, (ii) indicate features which suggest and identify endothelium as the primary site of RF damage, and (iii) suggest guidelines for further research. Several lines of investigation indicate that myocarditis is not a feature of rheumatic carditis. Vasan et al. studied the left ventricular function in patients with acute RF with and without carditis as well as with and without congestive failure. Left ventricular contractility and systolic function was normal despite the presence of congestive failure in the majority of patients with rheumatic carditis. They concluded that rheumatic carditis does not result in congestive failure in the absence of hemodynamically significant valve lesions. Radhakrishnan and associates used technetium 99m stannous pyrophosphate scan in 12 patients of acute RF. Myocardial staining was uniformly absent in all. They concluded that the technique was insensitive for the diagnosis of myocarditis in acute RF. Narula et al. used indium 111 -labeled antimyosin fab in patients with acute RF to identify the presence of myocardial damage. Except in the presence of pericarditis or congestive failure there was very poor staining indicating the absence of significant myosin damage. Edwards and Edwards evaluated the role of myocarditis as compared to valvular disease causing congestive failure in RF. 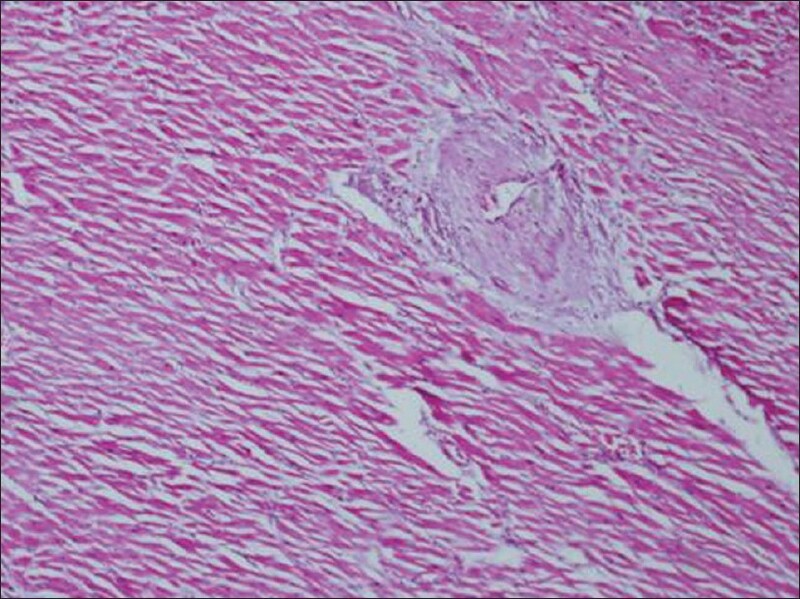 They stated that histologic examination in patients with active rheumatic myocarditis does not permit easy acceptance of this concept, because the lesions of active myocarditis are primarily interstitial without evidence of cellular myocardial necrosis. Aortic regurgitation of rheumatic origin strongly indicates an element of intrinsic valvular rather than myocardial disease. "Histologically the amount of myocardial damage due to myocarditis is so little that it fails to explain why patients of acute RF have died" (JEE: Personal communication). Kinsley and associates replaced mitral and/or the aortic valve in patients of acute RF, with deterioration despite anti-congestive measures. Following mitral or aortic valve replacement, the left ventricular size and function returned to normal and congestive cardiac failure subsided, with clinically ongoing carditis. They concluded that congestive cardiac failure was the result of an acute volume overload secondary to mitral and/or aortic valve regurgitation and not due to myocarditis per se. Histopathological findings of carditis, summarized by Virmani et al., indicate inflammatory changes in the sub-epicardial, sub-endocardial, and perivascular interstitial tissue with little myocyte disruption. 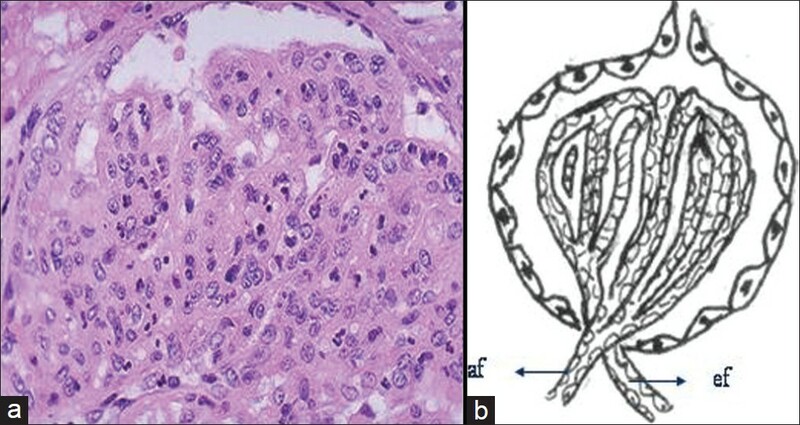 Aschoff nodules (AN) are strictly perivascular in location. The rest of the myocardium and the interstitial tissue is normal. AN contain lymphocytes, macrophages, β cells, and giant cells. Immunopathology of AN, studied by Gulizia and associates, indicates that it does not have any cells of myocardial origin. Therefore, Aschoff nodule, the hallmark of rheumatic carditis, is not derived from myocardial damage. Thus, the absence of myocarditis has been demonstrated and documented by (1) the absence of increase in markers of myocardial damage (CK-MB, Troponin-I), (2) echocardiographic left ventricular function studies, (3) radionuclide imaging (technetium pyrophosphate, indium 111 , antimyosin fab), (4) myocardial biopsy studies, (5) surgical management during active carditis, (6) histopathology and immunopathology. Since RF does not cause myocardial damage, and the fact that congestive failure occurs only in the presence of severe mitral and/or aortic regurgitation, it is possible to conclude that rheumatic valvulitis causing acute and chronic valvular damage determines the morbidity and mortality of RF. Despite this ubiquitous evidence why did involvement of myocardium get primacy? This could be explained by the similarity in structure between M-protein and the human tropomyosin. The GAS M-protein was identified and established as the virulence factor of the organism by Lancefield. , Further cross-reactive antibodies between M-protein and tropomyosin have been demonstrated. Research, therefore, was directed exclusively toward myosin. , Since it is now clear that myocardium (myosin) is not the target in RF, research needs to be directed elsewhere for the pathogenesis of RF to be identified. The primary site of RF damage appears to be endothelium with its basement membrane. The pathological findings of RF provide clues to the pathophysiology of RF. "RF is characterized by proliferative and exudative inflammation involving primarily collagen tissue or its ground substance. There is a pronounced tendency to affect tissues lined by endothelium, including blood vessels, endocardium, pericardium, and synovia." Pathological findings indicate that RF predominantly damages the endothelium, selectively throughout the body. However, due to its proximate location to endothelium, inflammation progresses to the sub-endothelial layer. Heart is the most extensively studied organ and the findings have been summarized by Virmani et al. There is evidence for inflammation which is confined to the sub-epicardial, sub-endocardial, and perivascular connective tissue of the heart in addition to a generalized vasculitis throughout the body. There is little myocyte disruption and the intermyocardial connective tissue is not damaged. The hallmark of RF carditis is the Aschoff nodule (AN). The AN is strictly peri-vascular in location with minimal surrounding myocyte and connective tissue damage [Figure 2]. The AN contains lymphocytes, macrophages, β cells, and giant cells. Immunopathology of the AN indicates that it does not have any cells of myocardial origin. Therefore, it can safely be concluded that the AN, the hallmark of rheumatic carditis, is not derived from myocardial damage. Except the perivascular area, the rest of the myocardium and the interstitial tissue are normal. Clinically individual joints have evidence for inflammation lasting 1-7 days. ,, "The synovial membrane is reddened and thickened and covered with fibrinous exudates. Histologically there is marked edema, engorgement, and dilation of blood vessels and diffuse and focal infiltrates of lymphocytes and polymorphs. Fibrinoid and histiocytic granulomas are formed." Arthritis has a limited duration of 2−3 weeks and heals without residual damage. Similar to other organs, arthritis can also be ascribed to endothelial inflammation. The specificity of pulmonary lesions is not certain since most patients who underwent autopsy were complicated by the presence of pulmonary edema from left ventricular failure. In summary, the histopathological data indicate widespread focal vascular endothelial disease throughout the body, though selectively. AN which are the hallmark of rheumatic pathology are not secondary to myocardial damage and are derived from mesenchymal tissue. A typical lesion measures upto 10.68 ± 0.06 × 10−2 mm 2 (mean area 9.43 ± 0.87 × 10−2 mm 2 ). AN contain 21% T lymphocytes, 13% macrophages, four% "β" cells, fibroblasts, and giant cells. Of the T lymphocytes, CD4+ cells and CD8+ cells are in a ratio of 2.0. CD4+ cells could be from 70% to 100% and the CD8+ cells from 0% to 30%. The dominant infiltrative cells are the T lymphocytes and the macrophages. The macrophages are not of muscle origin since they do not stain with HHF-35 monoclonal antibodies (mabs) specific for actin. The giant cells - owl eye and the Anitschkow - are negative for myosin, myoglobin, and desmin. The giant cells are positive for the presence of vimentin which is of mesenchymal origin. The macrophages express MHC antigens (HIA-DR+). Cytokine studies indicate the production of tumor necrosis factor and interleukin-1. Thus, the presence of AN is useful in identifying rheumatic inflammatory pathology but does not indicate the presence of rheumatic myocarditis. Besides the T lymphocytes, macrophage like cells, expressing class-II MHC antigens (HLA-DR+) are present. Antistreptococcal mabs (AS mabs) bind to valvar surface endothelium and the immediate sub-endothelial structures like elastin myofibrils and valvar interstitial cells (VICs). The VICs react strongly with AS mabs. The VICs do not react with mabs specific for myosin, actin, or elastin. Anti-vimentin mabs stain cytoplasmic vimentin exactly as the AS mabs. Pre-incubation of AS mabs with purified vimentin ablates all valvar staining indicating that the intermediate filament vimentin may be the main target of AS mabs. AS mabs do not react with collagen  indicating that it is not the primary site of RF damage. GAS infection results in suppurative and non-suppurative disease manifestations. The two non-suppurative manifestations are acute RF and acute glomerulonephritis (GN). An immunological basis for pathogenesis has been widely accepted for both non-suppurative manifestations. In RF, the permanent damage is confined to the cardiac valves. The MV develops from the wall of the left ventricle. Excavations appear in the wall of the Primitive ventricle to divide it into an inner component and the outer part. The inner component matures into three parts of the MV - superiorly the leaflet, the middle segment becoming chordae, and the lower part remaining as the papillary muscle. As such, the total MV is derived from the wall of the left ventricle [Figure 4]. The outer part matures as the wall of the left ventricle. The mitral leaflet consists of a central core of connective tissue, derived from the left ventricle, covered on both sides by endothelium. It has no muscle tissue and no blood vessels. As of today, information is not available comparing the proteomics of the mitral core connective tissue and that of the intermyocardial connective tissue of the left ventricle. Since the mitral leaflet is derived from the left ventricle, it is logical to believe that the mitral core connective tissue may be identical to the intermyocardial connective tissue of the left ventricle. If this assumption is correct (needs to be proven by proteomic studies) and the fact that intermyocardial connective tissue of the left ventricle is not involved in RF, one can conclude that the site of rheumatic MV damage cannot be the core connective tissue but the two layers of endothelium. It seems logical, therefore, to accept that in both the non-suppurative manifestation of GAS infection, the site of disease damage are the endothelial cells - glomerular in GN and valvar in RF [Figure 5]. This is reinforced by the involvement of vasa vasorum, composed of single-layer endothelial cell channels in arterial walls, as strong evidence in favor of endothelial cells as being the primary target of RF damage. Pathogenesis of acute GN indicates that the streptococcal M protein is not the antigen involved in causing the disease. Searching for the antigen utilizing renal biopsies has narrowed down the possibility to pyrogenic exotoxin B (SPE-B) as the most likely antigen responsible for acute GN. In addition to the renal deposition of the antigen (SPE-B), there is a specific antibody response to the antigen in the convalescent sera from patients with acute GN. It is thus possible that the streptococcal antigen responsible for acute GN may be pyrogenic exotoxin B (SPE-B). However, in the genomic studies of a strain of S, zooepidermicus which resulted in an epidemic of acute GN, the gene encoding SPE-B was absent. , Thus, even if SPE-B is involved in the pathogenesis of acute GN, it cannot be the sole antigen responsible for acute GN. Although both non-suppurative manifestations of GAS infection are based on immunological perturbations, there is a significant difference between the two diseases. Acute GN occurs once and recurrences are very rare. This suggests that the antigen responsible for acute GN is probably single, stable, does not mutate, and gives lifelong immunity. RF on the other hand is characterized by recurrences, which suggest that either (i) the antigen is strain specific, (ii) there is more than one antigen capable of causing RF, or (iii) the antigen mutates to result in a clone capable of inciting RF a second time. If either of these assumptions is correct, it would be difficult to design a vaccine to prevent RF. Since mutations are common and can occur over a short period, it is essential that the antigen antibody complexes obtained from a relatively large number of patients of acute RF be studied to recognize the causative antigen and its variants. In acute GN, renal biopsies have been utilized to obtain the antigen antibody complexes. , It should be possible to use a similar approach using biopsied subcutaneous nodules from patients with acute RF. Evidence for a direct relationship between M protein as the causative antigen for RF is not available. Most likely, the initial damage to the endothelium is due to a humoral immune response, resulting in VCAM-1 being expressed on the endothelium. This is followed by cellular immune response and damage through CD4+, CD8+ T lymphocytes, and macrophages getting attached to the valvar endothelium and migrating to the connective tissue core. , This sets up an inflammatory response. The inflammation is accompanied by neovascularization of the valve substance. The neovascularization results in the appearance of additional endothelial surface, providing more area which can get affected. A vicious cycle of inflammation, neovascularization, and further damage results in a scarred valve with permanent damage. Identification of the pathogenesis requires establishing the causative antigen and the site of damage caused by the immunological process [Figure 6]. The data presented suggest that the site of disease appears to be the valvar and vascular endothelium. The causative antigen needs to be identified and cannot be assumed to be GAS M-protein. There are many unexplained features, if it is accepted that RF is a disease of the endothelium. Kidneys and eyes are rich in vascular supply. Why should evidence for endothelial damage affecting the kidneys or the eyes be absent? Features of endothelial damage-specific diseases indicate that they have limited or focal distribution. It is possible that the RF-induced damage to vascular endothelium does not affect the kidneys or the eyes because of the difference in composition and function of the endothelium at these and other areas not presenting with clinical findings. Further, the evanescent nature of many of the features of RF can be attributed to the remarkable capacity of endothelium to heal. The damaged endothelium gets replaced by a new endothelium within days after any injury anywhere in the body. Healed endothelium does not show scars. 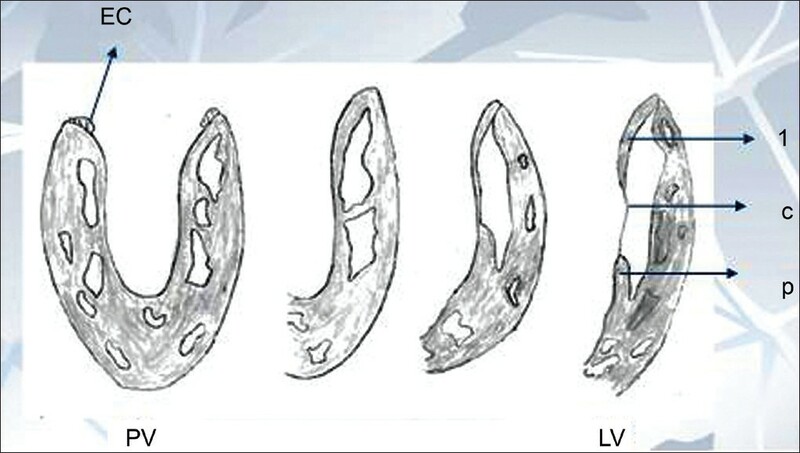 A patch or device closure of an atrial or ventricular septal defect gets endothelialized within a period of 4-8 weeks. , Vascular anastomoses get endothelialized quickly (within few weeks) and gross evaluation of the endothelium may fail to identify the site of anastomosis unless the adventitia is examined to identify the site of sutures since there is no scar formation in the endothelium. As such the endothelial damage of RF gets repaired quickly and fast throughout the body, leaving no trace of the disease except in the heart. The valves are structurally unfortunate in having a small core of connective tissue covered by two layers of endothelium. "Despite the diffuse collagen - vascular involvement, one of the mysteries of the pathology of RF is the remarkable tendency for the disease to heal rather than to scar the tissues it affects with the exception of cardiac valves (Stollerman). Since the endothelium repairs itself very fast, evidence for its damage will be lost very quickly. The subendothelial damage is limited to a very little depth hence scarring does not occur.". Except the cardiac valves all other manifestations - arthritis, subcutaneous nodules, and chorea - heal with no evidence for residual disease. The fact that the pathological findings are related to the endothelium and result in an inflammation of the subendothelial issue to a limited depth is the basic reason why RF does not leave evidence of scarring. Additionally it seems that the damage related to RF occurs over a brief period of limited duration. Why should an acutely inflamed joint recover on its own, without treatment, within 1-7 days time, leaving no evidence of damage? The only plausible explanation would be that the inflammation is confined to the synovial endothelium. Since the endothelium recovers its integrity quickly, features of acute inflammation, related to a limited duration of rheumatic activity, subside leaving an undamaged joint. This attribute of endothelial cells has specific implications in the study of the pathogenesis of RF. Each attack of RF has a self-limiting course. Joints recover in 1-7 days; erythema marginatum is evanascent, chorea has a self-limited course, and subcutaneous nodules subside mostly in about 6-8 weeks. Hence, it appears that RF probably has a very limited duration of active stage during which the immunological perturbations can be studied for identifying the antigen responsible for the disease manifestations. The clinical behavior of RF thus appears to be identical to the limited duration of disease activity (7−10 days) seen in acute GN, the other non-suppurative manifestation of GAS infection. A number of logical assumptions based on specific findings are involved in suggesting that the primary sites of damage in RF are the vascular and valvar endothelial cells (and the basement membrane). For identifying the initiating component, the antigens [Figure 6], in the pathogenesis and confirming that the second component (site of disease) is the endothelium, planned pointed research is necessary. Since endothelium appears to be the primary site of RF damage. It would be interesting to study the endothelial function in patients with acute RF, chronic rheumatic heart disease, and compare with normals. Obtain subcutaneous nodules from patients with acute RF and study the antigen/antibody complexes, as has been done with renal biopsies in acute GN, to identify the antigen(s) responsible for RF. Studies suggest that virulent clones of GAS organisms present in the community emerge to cause RF. Proteomic/genomic study of organisms (such as M 1 , M 3 , or M 18 ) obtained from RF epidemics or RF patients as compared to the same M type not causing RF is necessary. What are the proteomic/genomic differences between the virulent clone (causing RF) as compared to the non-virulent organism (not causing RF) which may help identify the antigenic protein(s)/glycoprotein(s). Proteomic composition of the MV core connective tissue to be compared with the proteomic composition of the left ventricular intermyocardial connective tissue. If they are identical, it would indicate that the primary site of disease in the MV cannot be the core connective tissue since it is not involved in the left ventricle. By exclusion, the primary site becomes the endothelial layers with their basement membranes. Study of the MV to find out the presence or absence of myosin. Since permanent damage occurs only to valves, the absence of myosin will reinforce the futility of pursuing studies involving myosin. (i) left atrial endocardium, (ii) left ventricular endocardium, (iii) atrial surface of the MV, (iv) ventricular surface of the MV. Proteomics as well as genomic studies of streptococci have been done. , The studies can be utilized as reference for further studies of pathogenesis especially in relation with streptococci obtained from RF patients to identify specific differences which may help in identifying the causative antigen(s). The author wishes to thank Mrs. Lata Joshi for help in the preparation of the manuscript. 1. Wannamaker LW. The chain that binds the heart to the throat. Circulation 1973;48:9. 2. Veasy LG. Lessons learned from the resurgence of rheumatic fever in the United States. In: Narula J, Virmani R, Reddy KS, Tandon R, editors. Rheumatic fever. Washington DC: Amer Regisr of Path AFIP; 1999. p. 69-78. 3. Oran B, Coban H, Karaasian S, Atabek E, Gurbilek M, Erkul I. Serum cardiac troponin-I in acute rheumatic carditis. Indian J Pediatr 2001;68:943-4. 4. Gupta M, Lent RW, Kaplan EL, Zabriskie JB. Serum cardiac troponin-I in acute rheumatic fever. Amer J Card 2001;89:779-82. 5. Kamblock J, Payot L, Lung B, Costes P, Gillet T, LeGoanvic C, et al. Does rheumatic myocarditis really exist? Systematic study with echocardiography and cardiac troponin-I blood levels. Europ Ht J 2003;24:855-62. 6. Vasan RS, Shrivastava S, Vijay Kumar M, Narang R, Lister BC, Narula J. Echocardiographic, evaluation of patients with acute rheumatic fever and rheumatic carditis. Circulation 1996;94:73-82. 7. Radhakrishnan S, Reddy KS, Malhotra A, Bhatia ML. Myocardial imaging with technitium 99m stannous pyrophosphate in acute rheumatic fever. Unpublished data: Thesis submitted to All India Institute of Medical Sciences 1986. 8. Narula J. Reddy KS, Khaw BA. Can indium III antimyosin scintigraphy complement Jones' criteria for the diagnosis of active rheumatic carditis? In: Khaw BA, Narula J, Strauss HW, editors. Monoclonal antibodies in cardiovascular diseases. Philadelphia: Lea and Febiger; 1994. p. 109-17. 9. Narula J, Chopra P, Talwar KK, Reddy KS, Vasan RS, Tandon R, et al. Does endomyocardial biopsy aid in the diagnosis of active rheumatic carditis? Circulation 1993;88:2198-205. 10. Edwards BS, Edwards JE. Congestive heart failure in rheumatic carditis: Valvular or myocardial in origin. J Am Coll Cardiol 1993;22:830-1. 11. Kinsley RH, Girdwood RW, Milner S. Surgical treatment during the acute phase of rheumatic carditis. In: Nyhus LM, editor. Surgery annual v.13. New York: Appleton-Century-Crofts; 1981. p. 299-323. 12. Virmani R, Farb A, Burke AP, Narula J. Pathology of acute rheumatic carditis. In: Narula J, Virmani R, Reddy KS, Tandon R, editors. Rheumatic fever. Washington DC: Amer Reg Path AFIP; 1999. p. 217-34. 13. Gulizia JM, McManus BM. Immunopathologic studies of Rheumatic fever. In: Narula J, Virmani R, Reddy KS, Tandon R, editors. 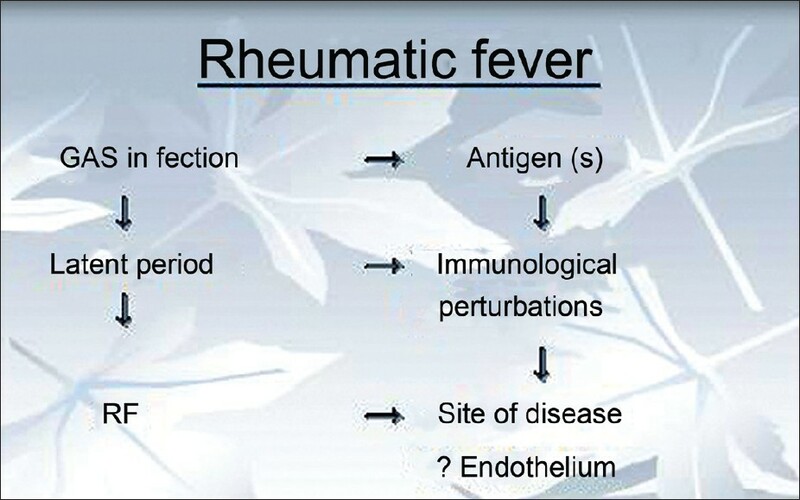 Rheumatic fever. Washington DC: Amer Reg Path AFIP; 1999. p. 235-44. 14. Lancefield RC. The antigenic complex of streptococcus hemolyticus-1, Demonstration of a type specific substance in extracts of streptococcus hemolyticus. J Exp Med 1928;47:91-103. 15. Lancefield RC. Current knowledge of type specific M-antigens of group A, streptococci. J Immunol 1962;89:307-13. 16. Krisher K, Cunningham MW. Myosin, a link between streptococci and heart. Science 1985; 227:413-5. 17. Nadia MJE, Kurahara DK, Vohra H, Mascaro-Blanco A, Erdem G, Adderson E, et al. Priming the immune system for heart disease: A perspective on group A streptococci. J Infec Dis 2010;202:1059-67. 18. Rheumatic fever. In: Friedberg CK (Ed.). Diseases of the heart. 3 rd ed. Philadelphia: W.B. Saunders; 1966. p. 1322. 19. Friedberg CK, Gross L. Pericardial lesions in rheumatic fever. Am J Path 1936;12:183-204. 20. Gross L, Friedberg CK. Lesions of the cardiac valves in rheumatic fever. Am J Path 1936;12:855-910. 21. Klotz O. Arterial lesions associated with rheumatic fever. J Path Bact 1913;18:259-69. 22. Bruetsch WL. Late cerebral sequalae of rheumatic fever. Arch Int Med 1944;73:472-6. 23. Buchanon DN. Pathologic changes in chorea. Am J Dis Child 1941;62:443-5. 24. Neuberger KT. The brain in rheumatic fever. Dis Nerv Syst 1947;28:259-62. 25. Bruetsch WL. Rheumatic brain disease: Late sequal of rheumatic fever. JAMA 1947;134:450-4. 26. McEwen C. Cytological studies in rheumatic fever. Cells of rheumatic exudates. J. Clin-Invest 1935;14:190-201. 27. Markowitz M, Gordis L. Rheumatic fever. 2 nd ed. Philadelphia: WB Saunders; 1972. 28. Stollerman GH. 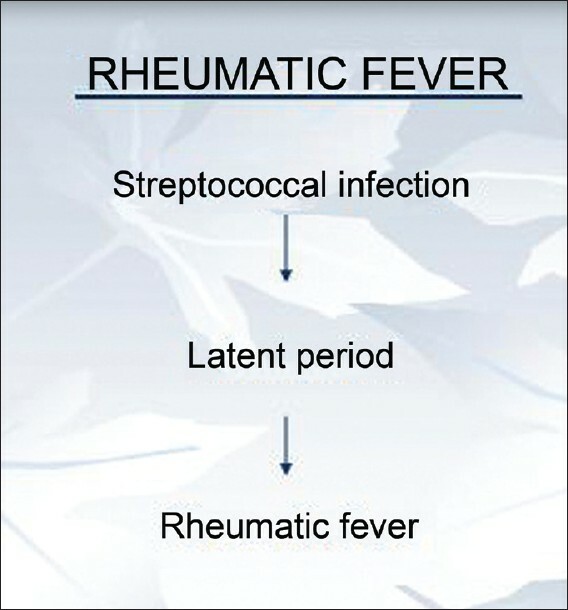 Rheumatic fever and streptococcal infection. New York: Grune & Stratton; 1975. 29. Bennett GA, Zeller JW, Bauer W. Subcutaneous nodules of rheumatoid arthritis and rheumatic fever: A pathologic study. Arch Path 1940;30:70-89. 30. Chopra P, Narula JP, Tandon R. Ultrastructure of naturally occurring subcutaneous nodules in acute rheumatic fever. Int J Card 1991;30:124-7. 31. Gross L. Lesions in the roots of the pulmonary artery and aorta in rheumatic fever. Am J Path 1935;11:631-46. 33. Gross L, Kugel MA, Epstein EZ. Lesions of the coronary arteries and their branches in rheumatic fever. Am J Path 1935;11:253-80. 34. Hartman SA, Bland EF. Rheumatic fever and glomerulonephritis: A clinical and postmortem study. Am J Med 1951;10:47-51. 35. Grishman E, Cohen S, Salomen MI, Churg J. Renal lesions in acute rheumatic fever. Am J Path 1967;51:1045-61. 36. Lustok MJ, Kuzma JF. Rheumatic fever pneumonitis: A clinical and pathological study of 35 cases. Ann Int Med 1956;44:337-57. 37. Rhea LJ. Rheumatic peritonitis. Am J Path 1933;9 (Suppl):719-24. 38. Paul JR. Medicine 1928;7:383. 39. Friedberg CK, Gross L. Periarteritis nodosa (necrotizing arteritis) associated with rheumatic heart disease: With a note on abdominal rheumatism. Arch Ind Med 1934;54:170-98. 40. Lin JS, Rodriguez-Torres R. Appendectomy in children with acute rheumatic fever. Pediatrics 1969;43:573-7. 41. Roberts S, Kosanke S, Terrence Dunn S, Jankelow D, Duran CM, Cunningham MW. Pathologic mechanisms in rheumatic carditis: Focus on valvular endothelium. J Infect Dis 2001;183:507-11. 42. Jennings RB, Earle DP. Post streptococcal glomerulonephritis: Histopathologic and clinical studies of the acute, subsiding acute and early chronic latent phases. J Clin Invest 1961;40:1525-95. 43. van Mierop LH, Alley RD, Kausel HW, Stranahan A. The anatomy and embryology of endocardial cushion defects. J Thoracic Cardiovasc Surg 1962;43:71-83. 44. Batsford SR, Mezzano S, Mihatsch M, Schiltz E, Rodriguez-Iturbe B. Is the nephritogenic antigen in post streptococcal glomerulonephritis pyrogenic exotoxin B (SPE-B) or GAPDH? Kidney Int 2005;68:1120-9. 45. Rodriguez-Iturbe B, Musser JM. The current status of post streptococcal glomerulonephritis. J Am Soc Nephrol 2008;19:1855-64. 46. Balter S, Benin A, Pinto SW, Teixeira LM, Alvin GG, Luuna E, et al. Epidemic nephritis in Nova Serrana, Brazil. Lancet 2000;355:1776-80. 47. Krishna Kumar R., Rammohan R, Narula J, Kaplan EL. Epidemiology of streptocoecal pharyngitis, rheumatic fever and rheumatic heart disease. In: Narula J, Virmani R, Reddy KS, Tandon R, editors. Rheumatic fever: Washington DC: Amer., Registr. of Path. AFIP; 1999. p. 41-68. 48. Aird WC. Endothelial cell heterogeneity. Crit Care Med 2003;31:S221-44. 49. Cooper ME, Bonnet F. Old field M, Jandeleit-Dahm K. Mechanism of diabetic vasculopathy. An overview. Am J Hypert 2001;14:475-86. 50. Asada Y, Sumiyoshi A, Hayashi T, Suzumiya J, Kaketani K. Immunohistechemistry of vascular lesion in thrombotic thrombocytopenic purpura with spetial reference to factor VIII related antigen. Thromb Res 1985;38:469-79. 51. Ridolfi RL, Bell WR. Thrombotic thrombocytopenic purpura, report of 25 cases and review of the literature. Medicine 1981;60:413-28. 52. Rosenberg RD, Aird WC. Vascular-bed-specific hemostasis and hypercoagulable states. N Eng J Med 1999;340:1555-64. 53. Minami T, Aird WC. Endothelial cell gene regulation. Trends Cardiovasc Med 2005;15:M4e1-174e24. 54. Lu L, Yang PY, Ru YCh, Kang H, Zhang J, Jhang JP, Feng WH. Comparative proteome analysis of rat brain and coronary microvascular endothelial cells. Physiol Res 2007;56:159-68. 55. Lock JE, Rome JJ, Davis R, van Praagh S, Perry SB, van Praagh R, et al. Transcatheter closure of atrial septal defects. Experimental studies. Circulation 1989;79:1091-9. 56. Das GS, Voss G, Jarvis G, Wyche K, Gunther R, Wilson RF. Experimental atrial septal defect closure with a new, transcatheter, self centering device. Circulation 1993;88:1754-64. 57. Simmons CA, Grant GR, Manduchi E, Davies PF. Special heterogeneity of endothelial phenotypes correlates with site-specific vulnerability to calcification in normal porcine aortic valves. Circ Res 2005;96:792-9. 58. Cole JN, Henningham A, Gillen CM, Ramachandran V, Walker MJ. Human pathogenic streptococcal proteomics and vaccine development. Proteomics Clin Appl 2008;2:387-410. http://ro.uow.edu.au/scipapers/72. 59. Musser JM, DeLeo FR. Toward a genome - wide systems biology analysis of host-pathogen interaction in group-A streptococcus. Am J Path 2005;167:1461-72. Kumar, R.K. and Tandon, R.